Photo by Jay W. Bennett Parkersburg South 126-pounder Tucker Windland, who defeated Huntington’s Alex Viars via an 8-0 major decision at Saturday’s Class AAA, Region IV, tournament inside Parkersburg’s Memorial Fieldhouse, became a four-time regional champ. PARKERSBURG — Four-time defending Class AAA state champion Parkersburg South posted 274 points and qualified its entire team at Saturday’s Region IV tournament inside Memorial Fieldhouse while Huntington nipped the host Big Reds, 199.5 to 172, to finish runner-up. Patriot 126-pounder Tucker Windland joined Highlander 182-pounder Zane Lanham as four-time regional champs. 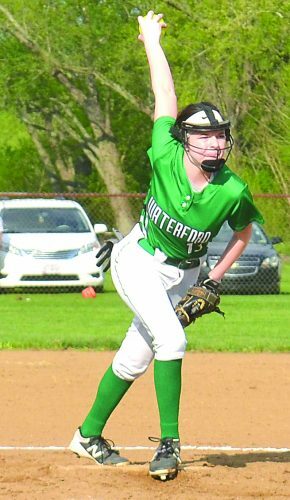 Windland, who was one of head coach Shaun Smith’s seven regional champs, blanked Huntington’s Alex Viars, 8-0. “It’s nice to be able to get my fourth regional championship,” said Windland, a two-time state runner-up. 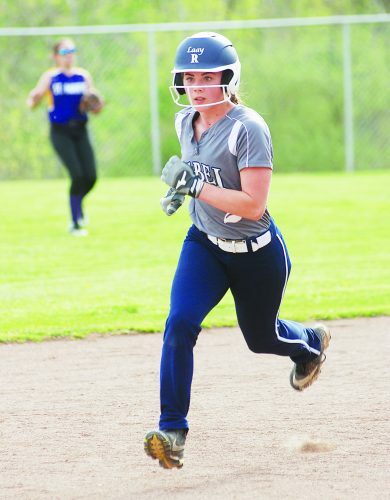 “Hopefully, this year I can make a run to the state finals and bring home a state championship for the first time. Lanham, who will be out for his third career crown for head man Rob Archer, had his hand raised for the final time at regionals after posting a 16-1 technical fall versus Patriot Dalton Fullerton. “I’m pretty excited for a fourth regional title,” said the Highlander senior. “I’m trying to get a third title at state. I thought we did pretty good. We wrestled really well in some weight classes and in some we didn’t. Parkersburg South 106-pound junior Samantha Miller, who finished fourth in the regional to become the first Patriot female ever to advance to state, got the day started for her team with a pin of Big Red George Cantwell. “She had a great opening match for us and it kind of got the ball rolling for everyone and the rest of her teammates,” coach Smith noted. “We had a really good day. Parkersburg South’s first title came at 120 where Brayden Johnson worked Highlander Devin Doss for a 7-0 decision. 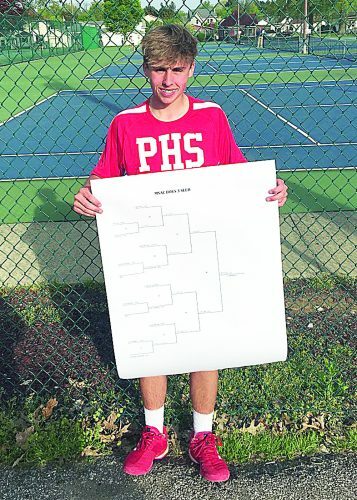 The Patriots and rival Big Reds went head-to-head in a trio of matches with PSHS coming out on top in each. Gavin Quiocho blanked Bo Moler, 5-0, at 138 while Brayden Roberts pinned third-seeded Big Red 145-pounder Ayden Edwards in 3:22. Patriot 160-pounder Zane Hinzman also got a mat slapper versus PHS’ Chace Mathess in 2:28. Two-time Ironman champ Braxton Amos needed 77 seconds to win by fall versus Huntington’s Tanner Ball at 220. Birthday boy Louden Haga concluded the regional with the fastest mat slapper, needing just 13 ticks to stick Cabell Midland’s Kellen Hunt. Coach Archer’s team had the lone overtime match and it didn’t go the way of the Highlanders as 106-pounder Jaishawn Lyles was upended by Cabell Midland’s Luke Jordan, 4-2. Leading 2-1 with five seconds to go in the third, Lyles was called for a technical violation and Jordan seized on the moment and got the winning takedown five ticks into overtime. At 113, London Bowen of HHS decisioned South’s Devin Easton, 10-6. 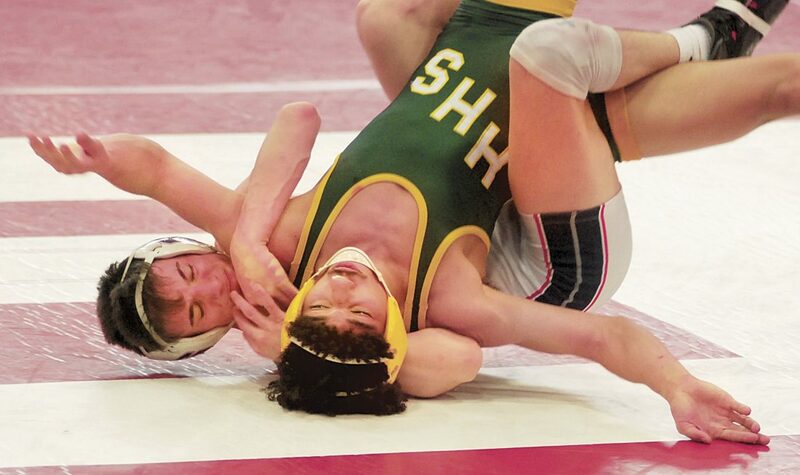 Spring Valley’s Eian Harper didn’t go down without a fight at 132, but came up short to Big Red Hunter Ackerman, 7-4. Parkersburg’s John Martin Best was too much for Highlander 152-pounder AJ Dempsey, who lost a 12-5 decision. Highlander Clayton Stewart caught Big Red Jalen King at 170 and won via fall in 52 seconds. In what was a rematch from the 195-pound Mountain State Athletic Conference finals, Spring Valley’s Chase Stevens got the better of Big Red CJ Wade this time around. While Wade won on a late takedown at the MSAC, Stevens came out on top with a pin in 3:28. “We got a few upsets and got a couple guys in that we weren’t supposed to,” said PHS head coach Matt Littleton, whose team advanced 10 wrestlers as did the Highlanders and Cabell Midland. “Obviously, we lost some we thought we could win. 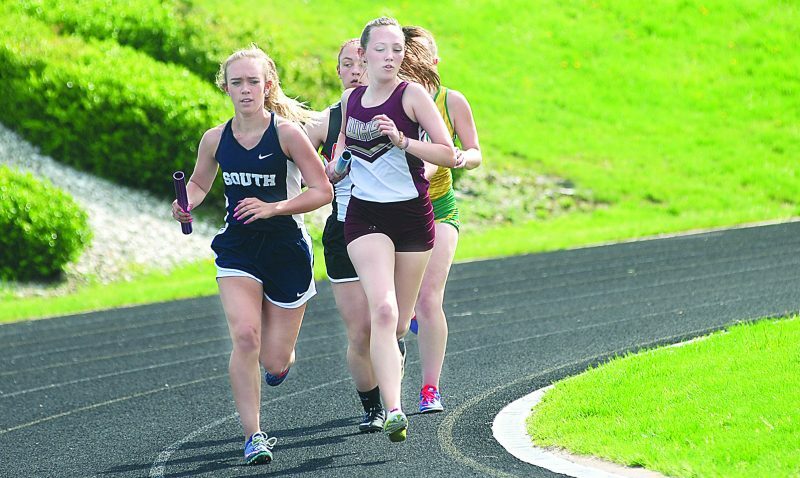 Although Huntington bested the Big Reds, who finished just ahead of Cabell Midland (170.5) with Ripley (110.5), Spring Valley (64.5) and Hurricane (47) rounding out the field, coach Archer knows there’s plenty of work left to do. “We’ve been behind Parkersburg all year so finally to get in front of them was good,” added the coach, whose squad also qualified Gabe Dempsey (138) and heavyweight Kordell Todd. “But, we got to do it again. It’s also the size of the tournament. A small tournament today. The cards will shuffle and we’ll go again. Zane has done a great job and he just continues to build every year. He’s not content with being a state champion. PSHS also qualified Jude Childers (132), Mikey Shamblin (152), Wyatt Linder (170) and 195-pounder Noah Buckalew. Big Reds also advancing to the Big Sandy Superstore Arena were Kage Mathess at 113, Garret Donahue at 120 and Levi Westfall at 126. Ripley head coach Matt Smith’s Vikings advanced eight to state thanks to Brock Matson (106), Brett Haskins (113), Nate Cox (120), Luke Miller (126), Ethan Koontz (152), Jarrett Paugh (160), 182-pounder Austen Boggess and 220-pounder Tanner Ross. Aside from Jordan and Hunt, Cabell Midland also had Payne Salmons (132), Isaiah Vaughn (138), Ki Taylor (145), Nate Neale (160), Ty Chapman (170), Zach Dillon (182), Ivan Vaughn (195) and Preston Rose (220) reach the final weekend of the campaign. The only Hurricane grapplers to advance were Treven Taylor at 145 and Redskin heavyweight Damion Saunders. Note: South’s Samantha Miller became the first Patriot female to qualify for the state tournament.